(Puno, Cochabamba, Washington, Ottawa) In recent weeks, international organizations from five continents have endorsed a public sign-on letter entitled Stop the Criminalization of Social Protest and Corporate Impunity in Peru!! (scroll down for English). 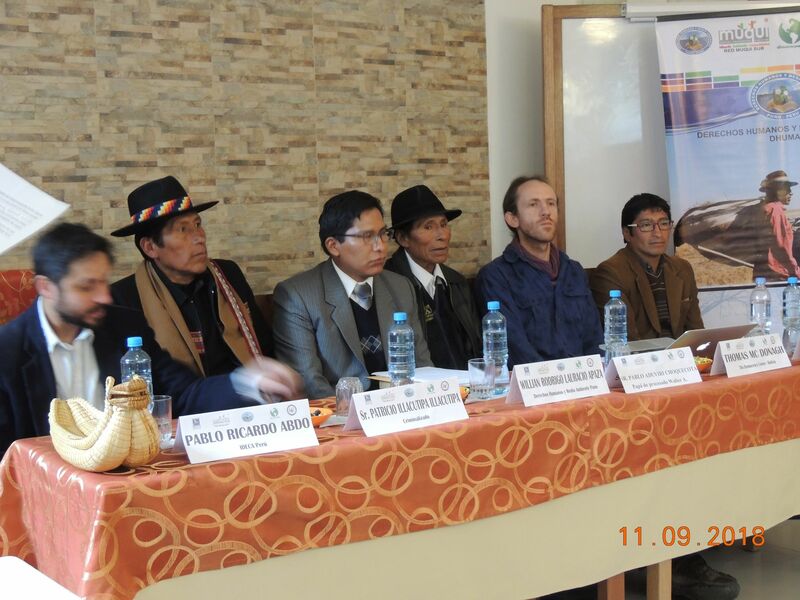 The initiative was promoted by local organization Human Rights and Environment - DHUMA of Puno (a member of the Peruvian National Coordinator of Human Rights CNDDHH and of the Muqui Network), in alliance with international organizations such as the Institute for Policy Studies (IPS) of Washington D.C., The Democracy Center in Bolivia and MiningWatch Canada. The letter, supported in total by 131 Peruvian and international civil society organizations, urges the Supreme Court to annul the sentence against Walter Aduviri. Aduviri was sentenced to 7 years in prison and ordered to pay more than USD$600,000 in damages, for alleged crimes committed during the socio-environmental conflict known as the "Aymarazo" in 2011. The case dates back to 2011, when communities in the Puno region mobilized against the Santa Ana mining project, owned by the Canadian company Bear Creek. The mobilization demanded the cancellation of the project due to the risk of contamination of their water sources (including Lake Titicaca, shared by Peru and Bolivia); the lack of consultation of local communities; questions around the legality of the project; a lack of transparency; and the company’s negotiating in bad faith with the communities. After protests were repressed, the government finally canceled the project. However, the Prosecutor's Office of Puno initiated criminal proceedings against the main spokespersons, which led to the conviction of Walter Aduviri in December 2017. 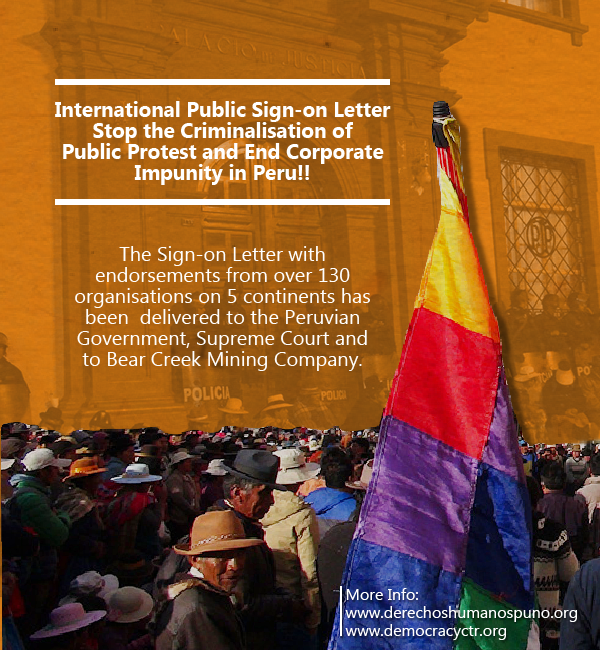 The sign-on Letter was delivered to the Peruvian Supreme Court on 5th September last. The official delivery of the document by human rights defender Yolanda Flores, representing the organization Human Rights and Environment - DHUMA, Puno, was broadcast live. Flores was accompanied by other defenders from Cajamarca, Selva Central, Cusco and Puno, as well as representatives of the National Coordinator of Human Rights - CNDDHH, who held a sit in in front of the Palace of Justice. 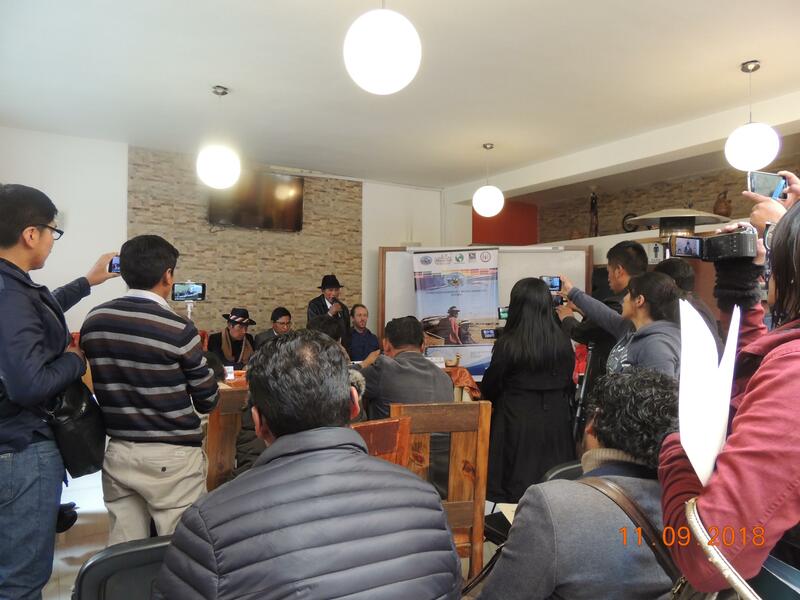 On Tuesday 11th September, in the city of Puno, a press conference was held in which the father of Walter Aduviri, Pablo Aduviri, with tears in his eyes, addressed the media demanding that the Supreme Court of Justice and the Government of Peru free his son from the unjust sentence. "My son cannot go to jail, my son is not a thief, he is not corrupt, he is not a murderer," he said, lamenting the great hardships that this process has brought on his entire family. Also present was Patricio Illacutipa Illacutipa, one of the other people prosecuted following the Aymarazo, who said that they are continuously labelled as "radicals, anti-mining, anti-system, anti-development" and that this is outrageous. "I personally have been psychologically destroyed for 8 years. Right now I'm fighting to get my family back," he said, referring to the consequences of being criminalized in this way. Illacutipa is now President of the Natural Resources Defence Front of Southern Puno. In his contribution he also rejected the payment of a multi-million dollar compensation that Bear Creek demands from Peru for the cancellation of its project in 2011. This was the result of a case that the company filed against the country at ICSID, the investment arbitration arm of the World Bank, in 2014. In December 2017, the same month in which the courts of "justice" condemned Aduviri, ICSID ruled in favor of Bear Creek and ordered Peru to pay more than USD$30 million in compensation, including legal fees and interest. Recent popular mobilizations have had an impact: Congress has stalled a bill proposing payment of US$31 million to the Canadian Bear Creek Mining Corporation as compensation for the 2011 “Aymarazo”. Last Thursday September 8th, the Budget Commission voted against article 13 of the 03121-2017 bill. According to an interview he gave with Telesur. Oracio Pacori Mamami, a lawmaker from Puno and head of the Commission, warned Congress about the social upheaval that passing such a bill would trigger. "We have warned the Economy Minister about this danger and that's why this payment has been suspended", Pacori Mamami said. This compensation is considered absurd and unjust by Peruvians involved in the struggle, and this sentiment was echoed at Tuesday’s press conference in Puno. "The Peruvian people have no reason to pay. Apart from the fact that they [the company] has violated collective rights and the constitution, now the company wants to be paid? We will never allow that. The people will have to rise up once more and a second Aymarazo will occur", said Illacutipa. On the contrary, he affirmed that it is Bear Creek who should compensate the people and the communities for provoking this conflict and causing losses in their economic activities during the days of mobilization. Rodrigo Lauracio, who was present at the conference on behalf of DHUMA, also expressed his rejection of the ICSID ruling. "Bear Creek mining company demands compensation, but the people who have been criminalised and who have been prosecuted ... there is no compensation for them. Seven years of attending hearings, of emotional and reputational damages....who has compensated them? ", he said. For his part, Patricio Illacutipa, in his final contribution at the press conference, called on the population in general, and in particular to local communities, to prevent the entry of mining companies into their territories. "These extractive companies, plunderers of our natural resources, will never enter. We have to defend our land and territory, our natural resources, our water sources, because water is life [and] mining is death," he said.